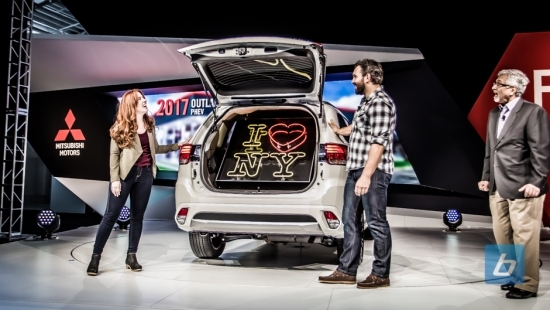 Buick took to the New York Auto Show to show off their all new Enclave Sport Touring. Following with he tradition of their Sport Touring models, the 2017 Enclave will receive primarily cosmetic improvements. The Enclave Sport Touring will have a Satin Black Ice grille and 20-inch wheels, also finished in Satin Black Ice. The Enclave will be powered by a 3.6L V6 which pumps out 288hp. Power is sent through a six speed transmission and customers have a choice between a front wheel drive or all wheel drive model. Also on the show floor is the facelifted 2017 Encore, featuring updated bumper, hood, fenders and headlights. Inside, an updated 8 inch touchscreen infotainment system hosts Apple CarPlay and Android Auto, giving drivers seamless integration to their smartphone. 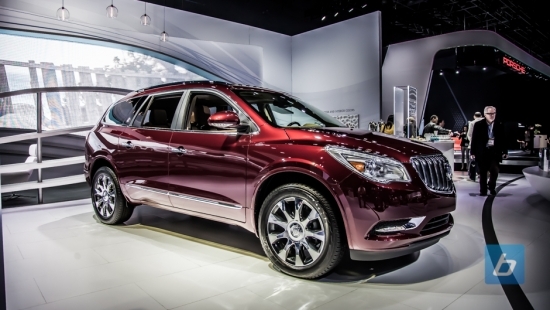 The 2017 Enclave Sport Touring will likely live on one more year in its current form. Plans are already in the works for a completely refreshed and redesigned Enclave for the 2018 season. 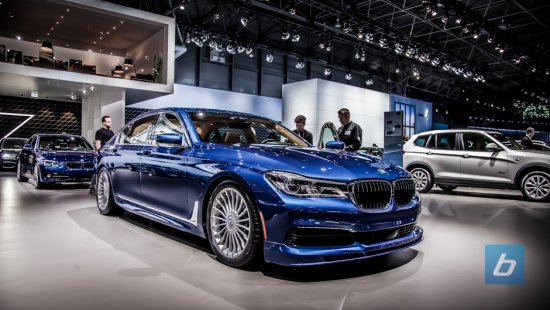 BMW debuts their all new Alpina B7 at the New York Auto Show today. The B7 is uses a new 4.4L V8 with twin-turbos an cranks out an impressive 600 hp and 590 lb-ft of torque. What’s even more impressive is the B7 can sprint to 100km/h in just 3.6 seconds. That’s a lot of mass moved in a very short amount of time, and the car will top out at 193 mph. The Alpina B7 uses a re-engineered and reprogrammed eight speed automatic transmission with close gear ratios allowing for quick and seamless shift creating a smooth run all the way to that 193mph. On the outside, the B7 wears a set of 20 inch Alpina classic wheels which perfectly suit this luxury performance sedan. Alternatively, Alpina offers a set of forged aluminum 21 inch classic wheels as well. In traditional Alpina fashion, the car features custom Alpina aero, a sport tuned exhaust, and can wear Alpina’s exclusive blue metallic or green metallic paint. The B7 is another beautiful from tuning house Alpina and we can’t wait to see it on the road. Company owner Christian Von Koenigsegg has said it before, he refuses to use electric technology to achieve the hyper levels of horsepower in todays hypercars. So that made the announcement that the Regera will be using a hybrid power source very conflicting. But Koenigsegg himself will be the first one to correct you and say don’t call it a hybrid. And in Koenigsegg fashion, this isn’t your typical hybrid. It has no transmission, but we’ll get back to that later. With only 3 years of production under its belt, the Mercedes-AMG CLA45 gets a minor facelift with subtle updates to make the CLA45 even better. We test drove and reviewed the original CLA45 over in Las Vegas a couple of years ago and have grown to love the little four door coupe from Affalterbach, and it’s great to see Mercedes-AMG continue to improve on what is already an excellent car. Starting with the exterior, the CLA45 gets upgraded aerodynamics in the form of an upgraded front bumper with the classic AMG A-Wing design, rear diffuser insert with 4 vertical fins, as well as a lip spoiler on the trunk. An optional aerodynamics package adds a larger front splitter, additional winglets, and a lip spoiler. Performance wise, last year’s upgraded drivetrain consisting of a 25hp bump (now to 381hp) along with the shorter gear ratios installed in the AMG 7 speed DCT improves on the original CLA45’s performance. 0 to 100km/h now arrives in only 4.2 seconds using the RACE START launch control system. 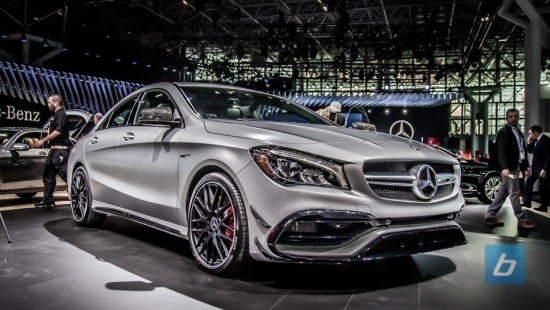 The 2017 CLA45 arrives in showrooms this fall. Check out our gallery below and let us know what you think of the upgrades. 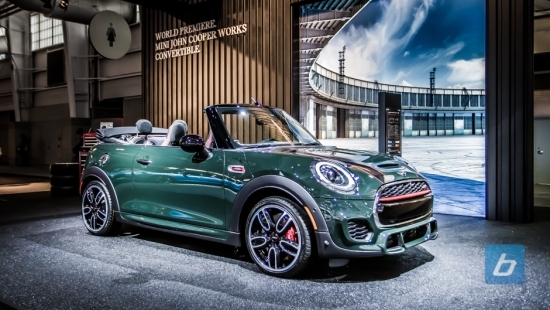 The MINI Cooper Clubman ALL4 and the John Cooper Works Convertible that were announced back in January both made their world debuts in New York at the 2016 New York International Auto Show. The ALL4 all-wheel-drive system is a front-wheel drive system that will shift power from the front to the rear wheels whenever conditions warrant it. The power shift takes just a fraction of a second. The new ALL4 system is also lighter and more compact than previous all-wheel drive platforms for improved handling and fuel economy. Both the Cooper Clubman ALL4 and Cooper S Clubman ALL4 come standard with a 6-speed manual transmission but an 8-speed automatic is optional. The MINI Convertible gets the John Cooper Works treatment with a stiffer suspension, redesigned body kit, 18″ wheels and red brake calipers. Under the hood on the JCW Convertible is a 2.0L turbo engine that pumps out 228 horsepower. Canadian pricing information is not available for these new MINIs but in the US the MINI Cooper Clubman ALL4 will start at $26,750, and the MINI Cooper S Clubman ALL4 will start at $33,330. The MINI Convertible John Cooper Works will start at $35,600. 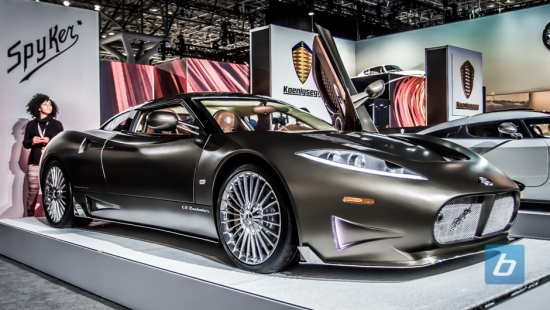 The Latest iteration of the Spyker C8, the Preliator is on display here in New York at the 2016 New York Auto Show. You may be thinking, didn’t Spyker go out of business? Yeah you wouldn’t be wrong but they resurfaced from bankruptcy with the help of an electric airplane company. That led many to believe that the next project from Spyker would be a full fledged electric vehicle of some sort but everyone was wrong. The C8 Preliator is not an electric vehicle, and in fact it still has the same Audi 4.2L V8 under the hood except this time around it has a supercharged strapped to it boosting output to just under 520 horsepower and 445 lb-ft of torque delivered to the rear wheels via a 6-speed manual or automatic gear box. The entire vehicle has been overhauled and improved compared to its predecessor. The all aluminium space frame has been redesigned and is 10% stiffer, the wheelbase has been increased providing a more stable ride and the interior has been revamped. The Preliator name, which means fighter or warrior in latin not only pays tribute to their aviation heritage (fighter jets) but symbolizes the rocky past couple of years in which Spyker has fought and won many battles only to come out stronger than ever. The C8 Preliator will be limited to 50 units and will begin production once the remaining units of its predecessor, the C8 Aileron are complete. 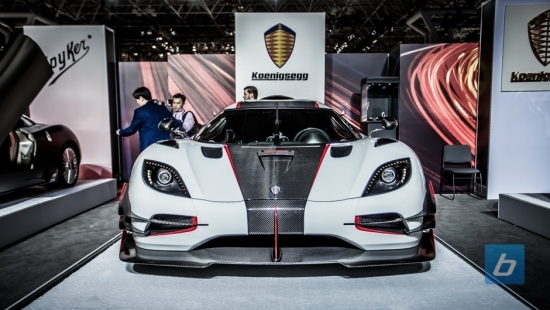 The Koenigsegg one:1 made its way to the New York Auto Show and made a huge splash infront of an American audience. When the company produced six vehicles for the 2014 Geneva Motor Show, all units were spoken for before it even made its appearance before the public. Fortunately, Koenigsegg continued to build more of these super cars. One thing the Koenigsegg does is blur the lines between what follows the other, form or function. Naturally, all Koenigsegg vehicles are build with function and purpose in mind, but you can’t deny that sometimes form creeps its way to the forefront. Regardless which follows the other, one can’t deny the beauty of a one off machined and cnc’d part made from aerospace grade aluminum like the paddle shifters which are engineered to give a specific clicking feel to convey gear engagement. With performance in mind, Koenigsegg managed to achieve the “dream” equation of 1:1 hp-to-kg curb weight ratio, hence the name One:1. 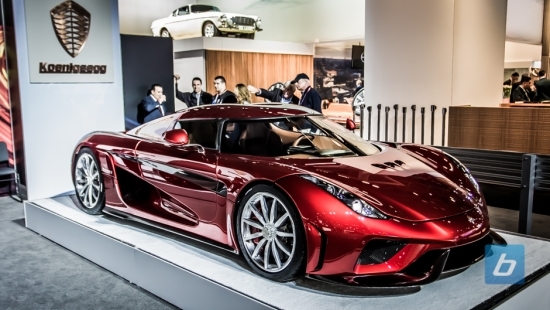 As the One:1 sits peacefully inside the New York Auto Show flanked on the right by a Spyker C8 Preliator, and snuggled up to Koenigsegg’s own Regera on its left, one can only stand back and embrace what it is they are seeing before their eyes. The One:1 is an engineering marvel. It exudes beauty across every inch of its body, and it expels performance out of every pore. Mercedes has come out big at this year’s New York Auto Show. 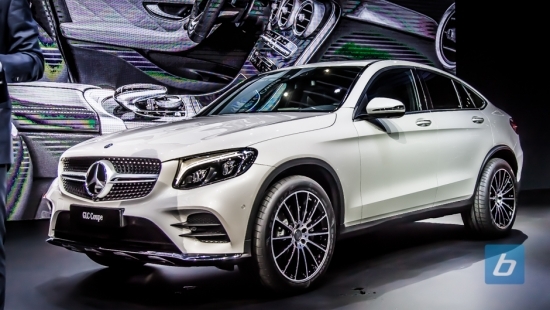 Among all the new vehicles they’ve debuted was the all new 2017 GLC Coupe. This particular SUV coupe has found its home in the silver arrows North American lineup. With coupe SUVs becoming commonplace, as well as the SUV market in North America continuing to strengthen, Mercedes will capitalize on this opportunity with their coupe SUV. The proportions of the GLC coupe is essentially a regular GLC that has been stretched out and lowered giving it that unique shape. The rear end utilizes a hatch style back to gain access to the large cargo space. The profile of the coupe makes it stand apart from its counterpart. The front end changes are subtle with a single barred grille. With the hunkered down profile of the coupe, rear passengers will lose some headroom, although not as much loss as one might think. The New York Auto Show marks a major milestone for Mitsubishi. This is the first time they will be unveiling their all new 2016 Outlander and it is with this SUV that they will be showcasing the company’s new design philosophy. On the outside, the Outlander gets a makeover utilizing more sophisticated design elements which helps boast refined look. The front facia now features a double barred chrome grille which prominently extends to the lower portions of the front bumper. Streamlined headlights housing dual projectors cap off the front end changes. Black textured body trim follows along the wheel arches and connects on the lower door sills to create a rugged yet refined look. The rear received a textured lower diffuser and redesigned tail lights. The changes are more than just what you see on the surface. The Outlander’s chassis incorporates over 100 new design and engineering changes which all aid to create a stronger and dynamic platform. The suspension has been redesigned to offer better dampening, reduction in vibrations, and an overall better driving experience. This is all thanks to the use of dynamic dampers in the front and rear of the vehicle which helps to smooth out the ride. Nissan pulled the wraps off of the upcoming Titan Crew Cab half-ton today here at the New York International Auto Show. The new Titan half-ton will initially launch as a crew cab model shown here, with the Single and King Cab models coming later in the model year. Under the hood of the new half-ton will be Nissan’s 5.6L V8 which is good for 390 horsepower. The engine will be mated to a 7-speed automatic transmission. For those that don’t need all that grunt, a V6 engine is coming. 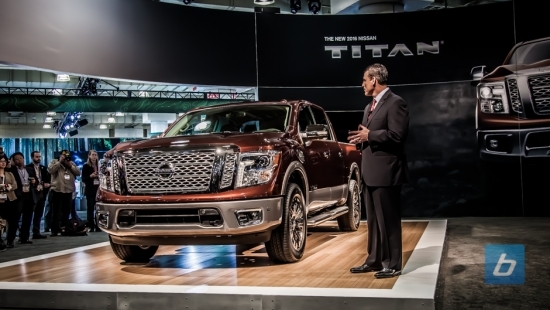 Nissan expects the new half-ton will be the highest volume Titan. Nissan also announced the starting price of the 2016 Titan XD Crew Cab will be $35,290 here in the US for the 4×2 model. Check out our gallery below of the Crew Cab half-ton.